Department of Justice Report Whitewashes Pulse Nightclub Police Response. In our opinion the report should have said it would have been better if the Keystone Cops had responded. We’re not talking about the average cop or swat team member, the fault lies with the chief and some of the brass. Parsons Green explosion: Hunt for Tube bucket bomber – latest news. Yes Britain, keep importing these terrorists and this is what you get. Ohio Bloodbath: Muslim Muhammad Barry Named Machete Attacker Hacking People in Nazareth Restaurant. Vetted by King Barry. 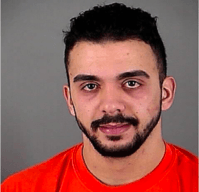 FBI thwarts mass shooting at Milwaukee Masonic Temple. Yet another peaceful Muslim jihadist. He didn’t go to Wally World and buy machine guns and a silencer. 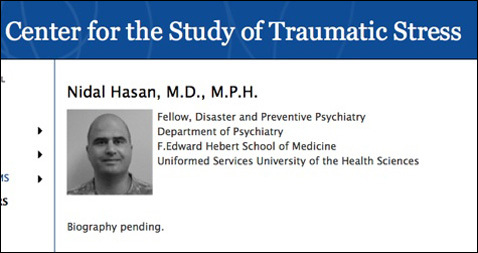 Appear’s he’s a US citizen, but if not we’d say he’s another great example of vetting. Muslim woman ejected from Donald Trump rally after silent protest: There is a reason this woman doesn’t protest reactionary Islam. Trump will have you removed from his event. They will have you removed from this life. Note- It appears that this individual is another Social Justice Ambulance Chaser picking on the weakest targets –see here. Woman Warns Philly Police That Alleged Cop Shooter Was Part of Radical Group. Oops! Not a lone wolf. Mayor Kenney On Officer Shooting: ‘It Has Nothing To Do With Being Muslim.’ Mayor Jim Kenney is delusional. Read his quotes from below. He said this in spite of the fact that the shooter admitted he pledged allegiance to the Islamic State and said he did it in the name of Islam. In no way shape or form does anyone in this room believe that Islam or the teaching of Islam has anything to do with what you’ve seen on the screen…. Man tries to assassinate Philadelphia policeman, says he did it in the name of Islam. So then, can we give him an Islamic punishment like throwing him off a tall building or cutting off his head or burning him alive? Death to the Great Satan. Unless there’s a really good sale going on. A London store called Designual held a sale called “Arrive Half-Naked, Leave Fully Dressed”. The first one hundred half-naked customers won an outfit of their choice. Needless to say, the line wrapped around the block and police had to be called in to control the surging mob. Not the customers, but the onlookers. 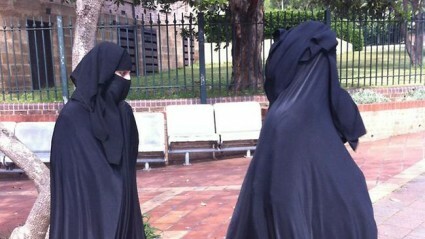 We’re still trying to understand this photo of a devout young Muslim woman. If this were a Perry Mason novel, Erle Stanley Gardner would have called it The Case of the Baffling Burka. Covered from head to toe in a burqa, with just a slit through which to see, a Muslim woman charged with making a false complaint to police now argues she has been a victim of mistaken identity. Carnita Matthews was stopped by an Australian policeman, who attempted to give her a random Breathalyzer test. She accused him of racism and said he attempted to forcibly remove her veil. Unfortunately for Carnita, the judge didn’t believe a word she said, found her guilty of making a false accusation and sentenced her to six months in jail. In case you’re wondering, that’s Carnita on the left. Or maybe that’s her on the right. Hmmm. We’re really not sure. Captain Kirk would never go for this. Neither would Picard. We’re pretty sure it’s a direct violation of the Prime Directive. Is Barry Soetoro (a.k.a. Barack Obama) operating under false identity? We think the first one is the same as the one we had before. The first and the second are the same except for some added captions in the second on, but we’ll keep both on here for safekeeping. Barry Soetoro a.k.a. Barack Obama? Who is Barry Soetoro? Yeah, it’s probably crazy, but that doesn’t keep it from being pretty damn interesting. Just exactly who is this guy who’s now President of the United States, Barry Obama, er, Barry Soetoro? Can we see the Barry Soetoro (Obama) records? And how about the Barry Soetoro birth certificate while we are at it. If you can’t blow ‘em up, sue ‘em. That seems to be the philosophy of 95,000 direct descendants of Mohammed. NEARLY 95,000 descendants of Mohammed are going to sue 10 newspapers for publishing “blasphemous” cartoons of the prophet. Faisal Yamani, a Saudi lawyer acting for the descendants, claims that the cartoons – which first appeared in 2005 and caused violent protests by Muslims around the world – are defamatory. 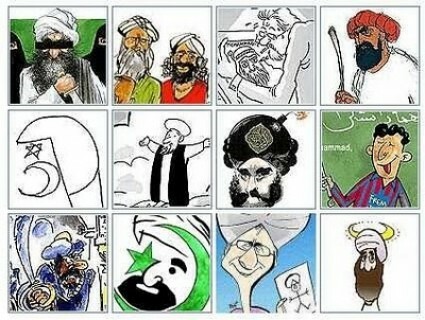 One of the 12 cartoons depicts Mohammed wearing a bomb-shaped turban. The Sunday Times said that although the cartoons were published by Danish newspapers, Mr Yamani plans to pursue legal action in England, where libel laws are weighted towards the plaintiff. English lawyers expect that he will argue that the cartoons were published in Britain via the internet and are a direct slur on his clients, who live in the Middle East, north Africa and even Australia. Mark Stephens, a British lawyer who saw Mr Yamani’s missive to the newspapers, told The Sunday Times: “Direct descendants of the prophet have a particular place within Muslim society … By effectively criticising and making fun of the prophet you are, by implication, holding them up to scandal, contempt and public ridicule. 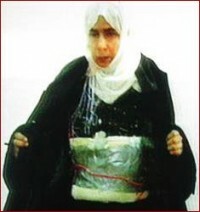 Just a little unsolicited advice from the legal wizards at IHateTheMedia.com: If the dynamite vest fits, you must acquit. He was supposed to be America’s first soul president, but he turns out to be just another sole brother. One of the key arguments of Barack Obama’s Presidential campaign was that he would improve America’s image around the world. This idea was based on the false assumption that anti-Americanism was due to factors peculiar to the Bush administration, as opposed to the basic realities of America’s role in the world and the hostility that many feel toward our values and interests. Thus, anyone foolish enough to believe that electing Obama would transform our international relationships must be disappointed. Say what? 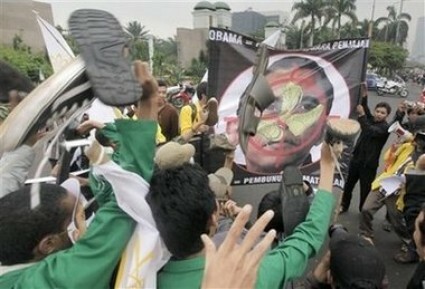 Throwing shoes at Obama? Not possible. Just not possible. The Muslim world loves us now that we’ve ousted the evil George W. Booosh. And they love President Obama because he gave them that pretty apology speech and he called America a Muslim country and all. We'll volunteer to conduct the waterboard interrogation. So would lots of other Americans. 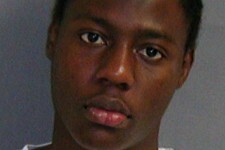 American voters want to break out the waterboard for Nigerian underpants bomber Umar Farouk Abdulmutallab. Or worse. Whatever it takes to get him to spill his guts. We’d say squeeze his nuts in a vise until he coughs up everything he knows. Unfortunately, that won’t be possible because his own pork and beans were the only thing this moron damaged in his attempted attack. We don’t need Jack Bauer here. We need Oscar Meyer. A guy walks into an adult store and says he’d like to buy an inflatable doll. “Black or white?” the clerk asks. Did it ever occur to those Muslim martyrs that the reason all the girls in Paradise are virgins is because they’re really fat and really ugly with bad personalities? Well, apparently, he’s against bringing them together in internment camps. Especially if they’re Muslim. Williams: We pulled something like this back in World War II when we decided to round up all Japanese Americans and put them in internment camps…The [anti-Muslim] rhetoric… could get out of hand. What do you think? Williams: Even if it comes out… that his frame of reference was his religion and that was what was giving him the power within himself to make his stand, that doesn’t mean that the religion is to blame. Farley: Absolutely, his interpretation [of Islam] may vary dramatically from [that of] his fellow Muslims. Let us state very clearly that we are opposed to internment camps for Muslims. On the other hand, interment camps for Air America hosts isn’t such a bad idea. The day after Major Nidal Malik Hasan’s murderous spree at Fort Hood, the BBC’s Gavin Lee visited the killer’s mosque, the Islamic Community of Greater Killeen. He spoke to Duane. Duane: I’m not going to condemn him for what he did. I don’t know why he did it. I will not, absolutely not, condemn him for what he had done though. If he had done it for selfish reasons I still will not condemn him. He’s my brother in the end. I will never condemn him. Lee: There might be a lot of people shocked to hear you say that. Duane: Well, that’s the way it is. I don’t speak for the community here but me personally I will not condemn him. Lee: What are your thoughts towards those that were victims in this? Duane: They were, in the end, they were troops who were going to Afghanistan and Iraq to kill Muslims. I honestly have no pity for them. It’s just like the majority of the people that will hear this, after five or six minutes they’ll be shocked, after that they’ll forget about them and go on their day. Sorry. Can’t find much to laugh about in this story. How many virgins does a terrorist get in Paradise when he's killed by bear? We’re not embarrassed to admit that we didn’t know they had bears in Kashmir. We’re also not embarrassed to admit that we got a certain perverse pleasure out of this story. 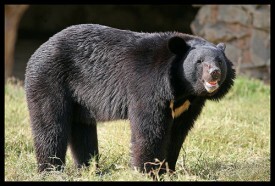 A bear killed two militants after discovering them in its den in Indian-administered Kashmir, police say. Two other militants escaped, one of them badly wounded, after the attack in Kulgam district, south of Srinagar. The militants had assault rifles but were taken by surprise – police found the remains of pudding they had made to eat when the bear attacked. It is thought to be the first such incident since Muslim separatists took up arms against Indian rule in 1989. The militants had made their hideout in a cave which was actually the bear’s den, said police officer Farooq Ahmed. The Obama administration immediately realized the military implications of this story. Malik Nadal Hasan murders 12 soldiers at Ft Hood. Networks dancing around what his name means. We hear that a Major Malik Nadal Hasan has murdered, execution-style, twelve soldiers at Fort Hood, Texas. Political correctness be damned. To us, the shooter doesn’t sound Baptist, doesn’t sound Catholic, doesn’t sound Jewish, doesn’t sound Hindu, doesn’t sound Buddhist. What does that leave? We wonder. But, we do recall the story of the founder of the Muslim-American BridgesTV network that beheaded his wife in Buffalo, New York. His name? 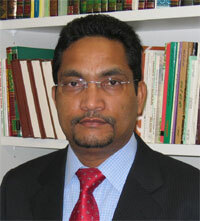 Muzzammil Hassan. UPDATE: We took down the Facebook page we had up, as we don’t think that was legit. The following image, from cstsonline.org is the one most suspect is him. 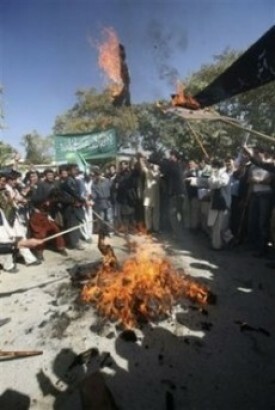 Afghani students burn Obama in effigy. They must be raaaaaacists. Oh, those irrepressible Afghani university students. They had themselves a grand old time the other day and it wasn’t even homecoming. University students play with a burning effigy of the President Barack Obama during a demonstration in front of the Afghan Parliament in Kabul, Afghanistan on Sunday, Oct. 25, 2009. Hundreds of Afghans shouted anti-US, NATO and Afghan government slogans and burned effigy of the President Barack Obama during a rally to protest a rumor that U.S. forces had bombed a mosque and burned a copy of the Muslim holy book, the Quran, in nearby Wardak province in mid-October. But…but…but he gave a speech in Cairo. 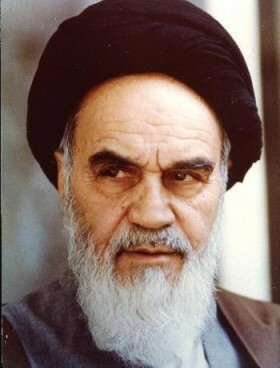 He told the Muslim world that we love them. He told them that everything was our fault. He told them his middle name was Hussein. Quick, Barack, give another speech. They seem to work really well. Wait. We stand corrected. The following comments weren’t made by an anti-Muslim bigot. They were made by Abdullah Saeed, head of the National Centre of Excellence for Islamic Studies at Australia’s Melbourne University. The silent majority (of Muslims) should strengthen its campaign of undermining the militancy and hatred advocated by the extremists. This campaign should begin at Friday sermons, in mosques, at homes, through lesson at Muslim weekend and day schools, in study circles and youth camps. This is no doubt happening but more needs to be done in view of the present situation. Remember a couple months ago when Janet Napolitano issued a report warning about the dangers of “homegrown” terror and suggested that conservatives needed to be watched? What’s that? They weren’t Christians? They were actually homegrown Muslims? Well, that certainly screws up this story. The lucky winner of a new reality show on Turkish TV and you win the biggest prize ever: eternal salvation. “Tovbekarlar Yarisiyor” (“Penitents Compete”) pits a Muslim imam, Catholic priest, Jewish rabbi and Buddhist monk against each other (like that hasn’t been done for thousands of years) in an attempt to convert 10 atheists to their religion. If you thought that was odd, wait until you hear the prize. The winning contestants will be given a pilgrimage to their new faith’s most sacred site —Mecca for Muslims, Jerusalem for Jews, Tibet for Buddhists, or the Vatican for Catholics. What makes this show so remarkable is that it’s the first time in the history of television that network executives have thought of worshipping anything other than the almighty buck.